What makes Sola® products low carb? Our Sola blend is comprised of naturally occurring sweeteners such as erythritol, tagatose, monk fruit and stevia leaf. Using this unique combination of low glycemic sweeteners, we have developed a variety of delicious chef-crafted food without all the carbohydrates. 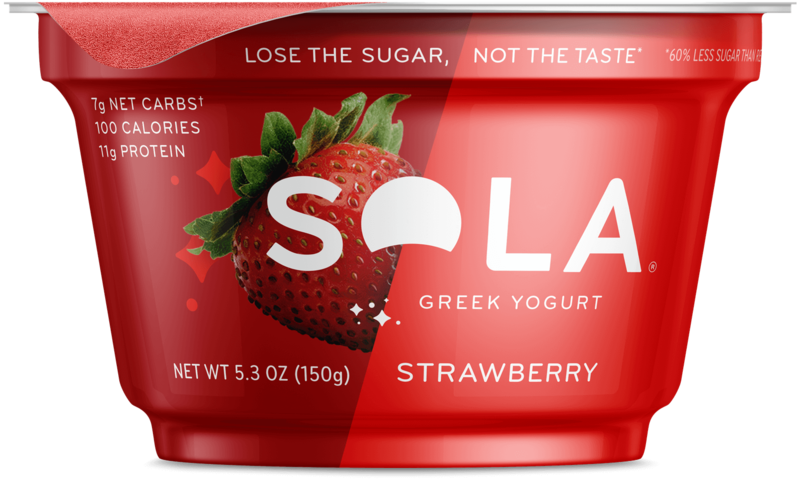 Even our highest net carb product is Sola® yogurt coming in at only 7 net carbs. We certainly think so. 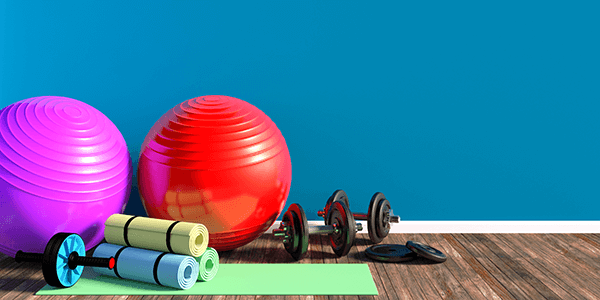 However, it may depend on your personal keto diet plan you are following in your day to day life. 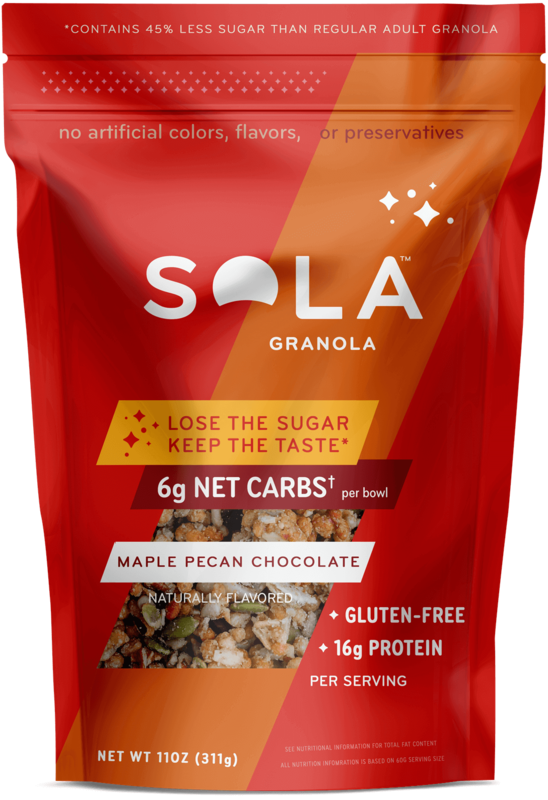 Sola has a variety of exceptional products to help those transitioning from a high carb diet to keto. The goal is to reduce glucose spikes and insulin release to maintain your keto goal. Sola products have been tested to insure low or no glucose and insulin release. This is why we believe Sola products are keto friendly. Maltitol, why do you have it? We recognize there are concerns with this particular sweetener. Our extensive independent third-party clinical studies conclude there is no glycemic response to our Sola Sweetener blend. The small percentage of maltitol in Sola assists with browning during the baking process. Our products range anywhere from a minimal 0.5 – 4g per serving. Will Sola products kick me out of ketosis? Nope! 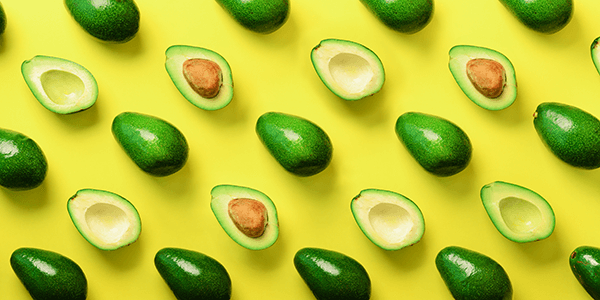 When consumed in appropriate portion sizes, our tasty products should not take you out of ketosis. Most of our products are compatible with a balanced keto meal plan, however we all have different chemistry. Simply try one serving of the Sola product of your choice and see how your body responds. We would like to hear from you and your findings! 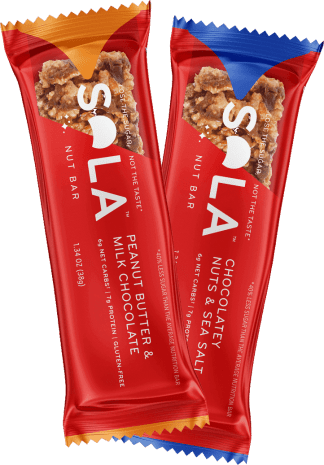 Where can I find Sola products? We’re currently available in some grocery stores like Harris Teeter, Hy-Vee, Jewel-Osco, Meijer, and H-E-B. Please check our store locator to find a location near you or you can find all of our dry goods on Amazon. Feel free to ask your local retailer to stock our products! 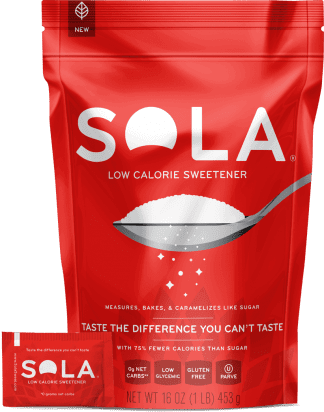 Does Sola contain Aspartame, Sucralose, or Saccharine? No, Sola does not contain these artificial ingredients. We are proud to say we provide you with quality ingredients that can be found in nature. Is Sola the one selling the products on Amazon? Yes, that’s us. You can find us on Amazon! Does Sola ship outside the US? No, we currently only ship to the contiguous 48 states. 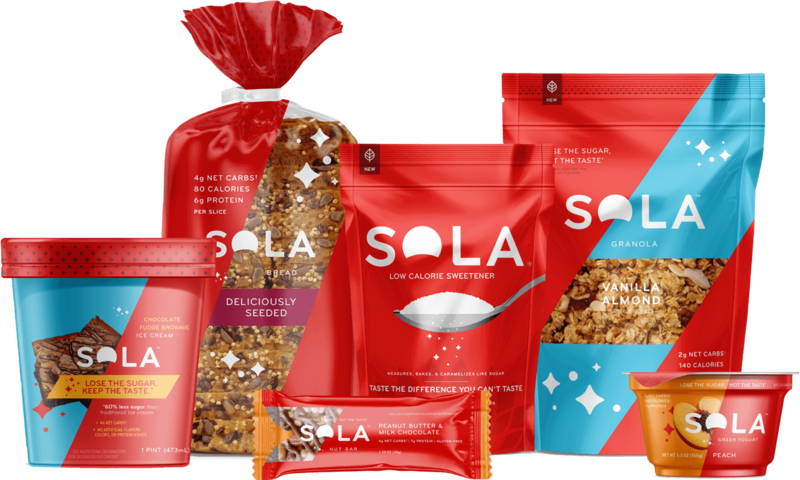 What Sola products are gluten-free? Many of our products are gluten-free, such as our granola, nut bars, and six of our eight ice cream flavors. The six flavors are Chocolate Peanut Butter, Mint Chocolate Chip, French Vanilla Bean, Strawberry Vanilla Bean, Butter Pecan & Salted Caramel, and Salted Caramel. No. 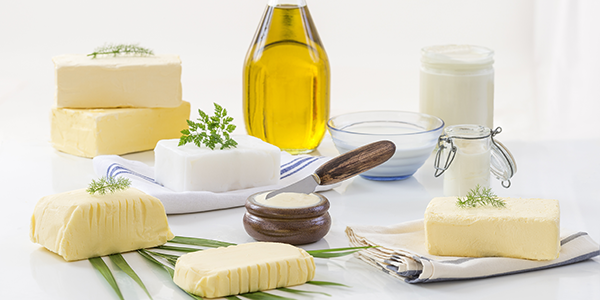 Due to the fact that tagatose, one of the ingredients in our Sola Sweetener, is derived from a process involving the lactose component of milk, we are not able to classify some of our products as vegan. Our patented Sola Sweetener blend is certified OU Kosher Parve. We are working on certifying the rest of our product line as well. 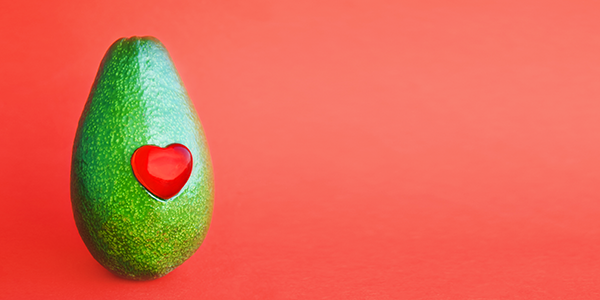 Are your products diabetic-friendly? Do all Sola products have a low blood glucose response? Yes! 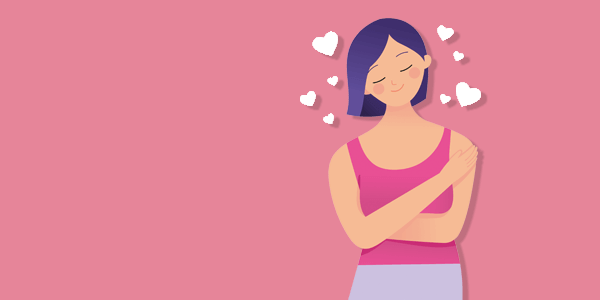 We have conducted third party double-blind independent clinical studies on all Sola products to ensure we are delivering a ‘better for you’ product that does not negatively impact blood glucose. 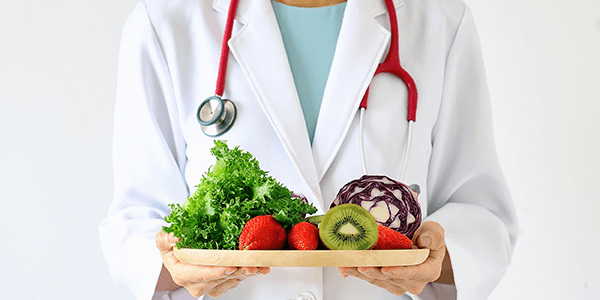 Whether you are pre-diabetic, diabetic or simply in search of removing unwanted sugar and carbohydrates from your diet, our mission is to partner with you in your journey towards a healthier lifestyle. Why is there sugar listed in your nutritionals when you claim less sugar? Simply based on their chemical structure, the FDA requires tagatose and allulose (which is used exclusively in our SOLA nut bars) be labeled as a sugar, even though they behave like a sugar alcohol and do not impact blood glucose. Sola sweetener and tagatose are NOT the same as sucrose (table sugar). We believe this is one reason why there is confusion about many food products. Will Sola work well in all recipes? Sola sweetener bakes and browns just like sugar but there are just a few unique instances where Sola is not recommended, such as making a crispy meringue. Sola does however work great in soft meringues atop delicious baked goods like Sola lemon meringue pie. Does Sola cause gastric distress, headaches/migraines, or nausea? Sola Sweetener is typically well tolerated, but as with most sugar alcohol-based sweeteners, excessive consumption may cause gastric discomfort. We recommend serving sizes which do not exceed 30-40 grams of Sola in total per day to minimize the risk of any potential effects. We haven’t had any reports of headaches or migraines with consumption of Sola products. We recommend using Sola packets when desiring beverages that are more highly sweetened. You only need 1 Sola packet to sweeten like 2 teaspoons of sugar. What’s the shelf life of the bread? Sola bread will stay fresh for up to 2 weeks at room temperature and can be stored frozen for up to 6 months. We recommend freezing shortly after receiving and remove from freezer as needed. How should I store my Sola ice cream? 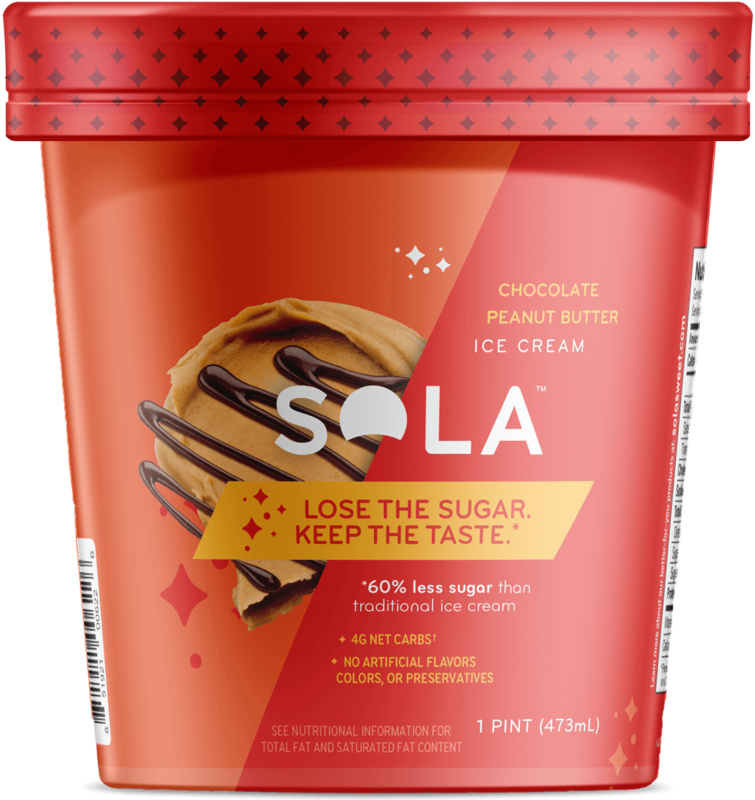 If Sola ice cream is not stored in a continuous frozen state, you may experience some retraction from the edges of the carton. There’s nothing wrong with the product but like many other ice creams, as it softens air is released and shrinks the product slightly. Please keep frozen until ready to use. 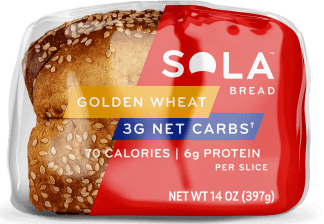 Why is Sola bread expensive on Amazon? We try our best to keep it as affordable as possible. Providing our bread through online channels makes it a bit more expensive than in store because of logistics. For online commerce, we have to factor things such as labor, warehouse, freezer storage and more. We still think compared to the competition we are a cheaper option since we provide free shipping, variety packs and 3-packs. We’re trying our best to make sure you get the most for what you pay. However, we understand the want for more affordable and accessible Sola bread. Help us make this happen by requesting Sola at your local store! How long should I let the Sola ice cream sit out? It depends on your preference, but we usually recommend letting it sit out for 5 – 10 minutes or add 5 more minutes for a creamery consistency. Can’t wait? Pop it in the microwave for 10-15 seconds. Microwaves vary in strength so pop it in for 15 seconds, then another 10 to 15 seconds as needed. Some patience required! If we did, browse our products. If not, please contact us with any additional questions.